After doing some test last week Remco asked me how the droplets would look like, I went on to test them inside Realflow since it has a simple shader setup and a Maxwell render engine. But it will not have the same effect when you export the mesh and use V-Ray to lighten the scene. That’s why I did this test, It’s like a puddle exploding! I haven’t posted anything in a while so I’m posting several posts. Last week I was busy creating droplets on the helm of the robot. I’ve discovered that showering the robot in one go and hoping for droplets to be forming is not the way to do it, there is not enough control for that while “showering” the robot. Instead i’m creating droplets by putting a sphere emitter around each individual part and attracting the particles onto the body parts. 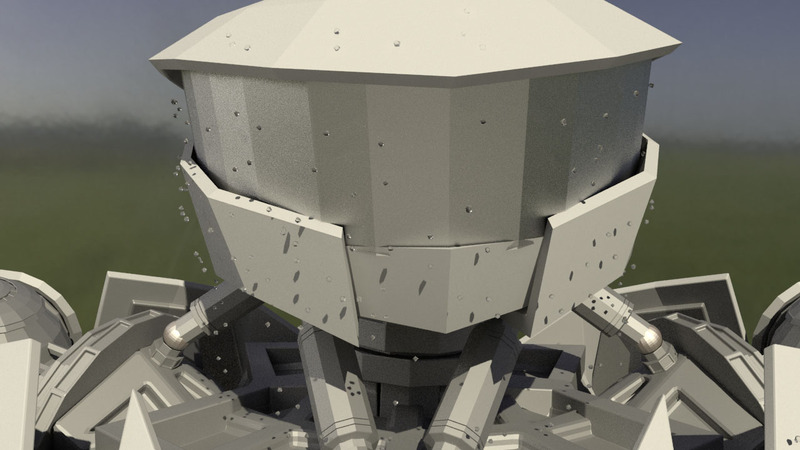 Currently I’m working on the helmet and I can control the size of the droplets much better. I’m trying to get the size right by doing these tests, you have to imagine that the robot’s head is around 1.30 meters wide and 0.84 meters high. More tests are incoming. I continued playing with BiFrost but it didn’t have the necessary elements yet, since it is so young. That’s why we switched to RealFlow, they provided us with a educational setup for the project. The water in this sim feels too thick for the robot. So i want to use way less particles. However I am very happy with the stickiness result, the water really is dripping of the robot as intended. Just need to use less particles. 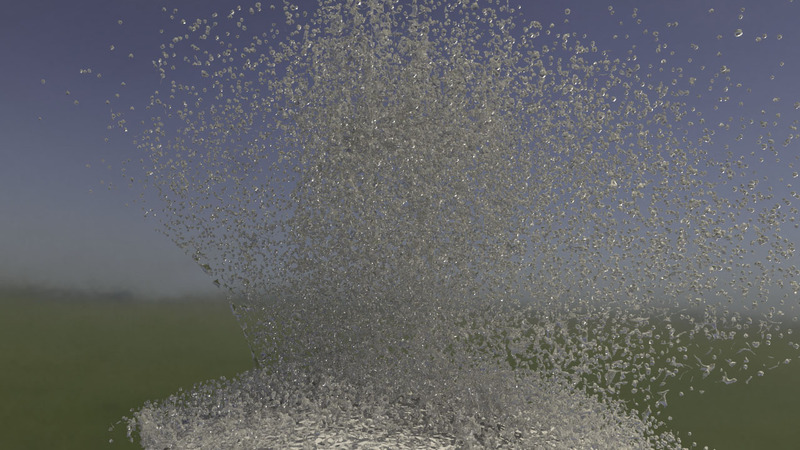 Also the particles need to slide less on the floor since it’s tarmac in the real footage. Ok, after a lot of BiFrost tests I came to the conclusion it is not possible withing BiFrost to have a lot of control over the fluids. 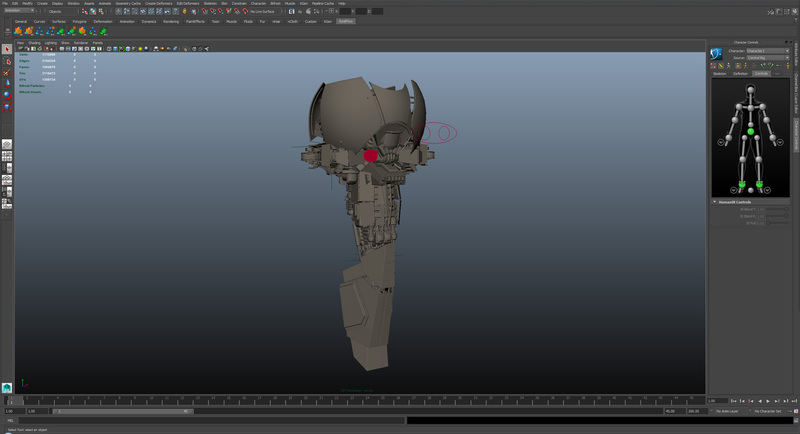 Since BiFrost is new in Maya 2015 it is still young in development. That’s why we can’t have what we want to have. Another solution to our problem would be a highly professional fluid sim called RealFlow. Remco told me just to email RealFlow explaining what this project is about and what we are doing within Saxion, maybe this way we could get a cheaper version of RealFlow since the commercial version might turn your piggy bank upside down! One email later I got the response that RealFlow is FREE FOR UNIVERSITIES! Joy oh joy!!! I got a message from RealFlow that the only thing they needed was my student email address and that they would set me up with RealFlow. Once I emailed my contact information for my student email address i was setup with a RealFlow Learning Edition licence. They responded within 10 minutes. I was able to download the software from the website and I was on my way. 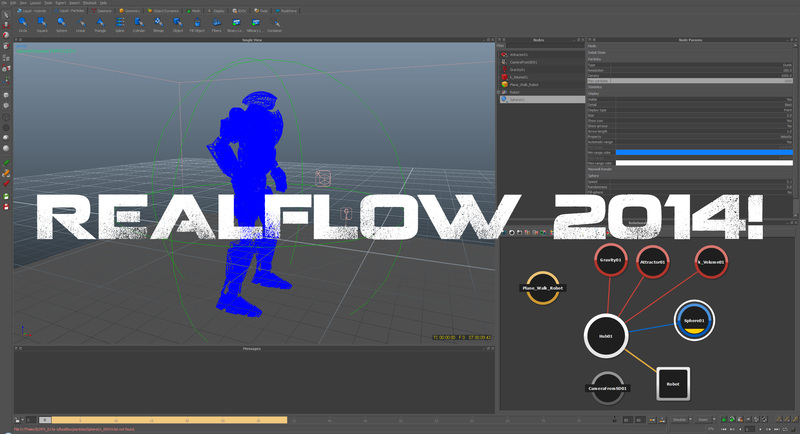 So special thanks to you, Dan from RealFlow for the great support and very quick response! Today I broke the robot. The last Stickiness Strength test was not succesfull, Stickiness Strength alone does less than what i expected. I tested Stickiness Strength from one up to a million in big steps, but no clear result. I am now going to test adding Stickiness Bandwith to it. The water needs to stick to the robot, that is why I created 4 different Stickiness Strength playblasts. I didn’t notice any difference in the first three playblasts so i decided to up the amount drastically for the fourth. The next four tests are going to be huge numbers to see what the difference is. It is because of the scene size that the stickiness has to be so big. I’ve learned to animate the robot a bit about a week ago, i know now how to handle HumanIK and how to make basic animations. So in this video you get to see kind of what the end shot is going to be like. At first the robot of course needs to be drenched in water, that’s why he is standing still. After that the animation starts. The water needs to stick as much as possible, so that the robot is still dripping in water when animated. This is the actual footage and 3d tracked scene. The animations are basic, but Hajir is going to make the animations for the actual end shot. I just needed the basic setup so i can experiment with the water. So yesterday I’ve setup my first scene ever. Toon provided me with the tracking data and Hajir and Ivaylo helped me a lot on setting up the scene. It’s actually quite simple now that i look back on it, but the results that you get are amazing. Once importing the track locators you have one camera that does all the work, attach a backplate to it which contains your footage and you are pretty much done. So easy but very powerful. To make it even better for yourself you can rotate the camera, tracking points and ground plane (which Toon also provides) to the grid of your Maya scene. This way you can create anything on the grid and it matches perfectly (movement wise) in the real footage. The robot has to be covered in water for a scene in our movie. So I got the robot rig from our 3d guys so i can work with it. The water really has to stick to the robot so it looks like it’s slowly dripping off the robot. In this scene i’m using a Stickiness Strength of 10 found under the emittershape. Copyright © 2017 Thebatchman.nl. All rights reserved.